Mercedes has officially unveiled the AMG GT3, following this morning's leak. Based on the Mercedes-AMG GT, the GT3 is a high-performance race car that was designed to meet FIA GT3 specifications. As a result, it has an aggressive carbon fiber wide body kit that includes modified bumpers, ventilated front fenders, revised side skirts and new doors. The car also has a ventilated hood, carbon fiber flics, a rear diffuser and a prominent rear wing. The stripped out interior boasts a carbon fiber racing seat, a digital instrument cluster and a steel roll cage. We can also see a new steering wheel, race-specific switchgear and carbon fiber trim. 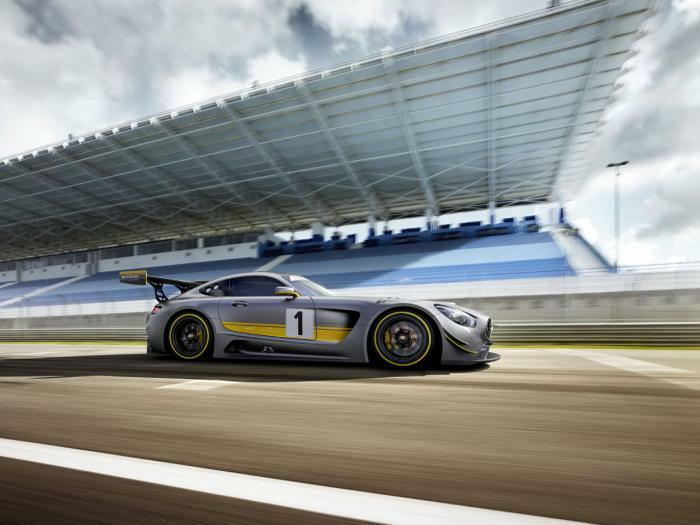 Mercedes was coy on specifications but confirmed the GT3 is powered by an upgraded version of the 6.3-liter V8 engine that resided in the SLS AMG GT3. It is connected to a six-speed sequential racing transmission. The Mercedes-AMG GT3 will go on sale shortly and the first deliveries are slated for late this year.